When the Disney Fantasy came out of dry dock this spring, it brought with it some expanded opportunities to engage youth. Specifically, these youth areas oversaw a transformation that included many film properties that are popular with children right now. One area, the Super Hero Academy, looks to have been lifted straight out of Doctor Strange’s Sanctum Sanctorum. The debut was met with plenty of publicity, but no article really hit the nail on the head than the one posted on the Academy’s bulletin board from Ben Urich and the Daily Bugle. 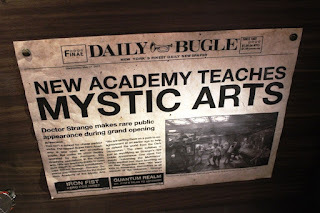 I won’t bore you with the article; suffice to say this version of the Super Hero Academy focuses more on the mystical and scientific arts than its Avengers counterpart. The newspaper itself should ring a few bells, as it is the source for news, both real and sensationalized, in the world of Marvel comics. It is the place where J. Jonah Jameson made a name for himself, and it has staffed everyone from the aforementioned Ben Urich to none other than Spider-Man himself, Peter Parker. What does interest me about this newspaper clipping, however, are a few of the details scattered throughout. Let’s start with the publication date, May 17, 2017. This is the easy one to start with as it is the date the Disney Fantasy came out of dry dock and once again took to the open seas. Moving down the page, to the bottom right, we see the headline for another article in the edition. This one is tied to Danny Rand, aka the Immortal Iron Fist. The headline reads, Iron Fist: Hero for Hire? This is a reference to the history of Danny Rand, but more so his compatriot, Luke Cage. Luke Cage’s original comic in the 1970s was titled Luke Cage, Hero for Hire, but was later altered to Luke Cage, Power Man. With his own standalone series not performing as well as Marvel would like, Iron Fist’s series was scraped and he joined up with Luke Cage. Eventually, in issue number 54 of Power Man and Iron Fist (again, a retitling of Luke Cage’s original solo book), the Heroes for Hire name was given to their team, a fully licensed investigative and protection organization. In the most basic sense, the Heroes for Hire are the beginning of the more recently formed Defenders. Right next to this headline is another that features the original Ant-Man, Hank Pym. It reads, Quantum Realm: Dr. Pym’s Tales to Astonish. In case you haven’t guessed already, Tales to Astonish was a 1950s and 1960s comic series that is the birthplace of Hank Pym and the Ant-Man. Tales to Astonish was actually a science fiction anthology series that gave rise to many individual comic characters, Hank originally starred in a standalone issue story, but would return a few issues later for a larger arc as Ant-Man, and later as Giant Man. The rest, as they say, is history. It is worth noting that Tales to Astonish also heavily featured the Hulk, and would become The Incredible Hulk with issue 102, another of the series long-running stars. As for the Quantum Realm, the alternative realm of mysticism, magic, and science has long been a staple destination of the comics. In the Marvel Cinematic Universe, however, it is the current resident of Hank Pym's wife, Janet van Dyne. The fine print is always crucial when it comes to contracts, but it is almost more important when exploring details left behind by Disney’s imagineers. While I may not be a master of the mystical arts, the crew aboard the Fantasy told me, a la Yoda, that I was too old to begin my training, I’d like to think my eye for the mystical and magical has only been strengthened through the years. In the case of the Super Hero Academy, it also helps to have a deep history with comics!